Good Food for Good Times. Featuring delectable Lebanese and American cuisine, the Sandtrap Bar and Grille is your neighborhood destination for an appetizing lunch or dinner any day of the week. Expertly prepared by our premier chef and served by our friendly waitstaff. Highlighted by amazing views, our spacious deck seating gives you a birds’ eye view of the golf course like you’ve never seen it before. Sip a glass of wine, feast on delicious cuisine, and enjoy a fabulous dining experience while overlooking the gem of the Merrimack Valley. Unwind every Thursday night when we feature the area’s best musicians and entertainers. Sit back, relax with a cold beer and appetizer, and enjoy the soulful sounds of the talented George Williams unplugged. Located inside the Merrimack Valley Golf Club. 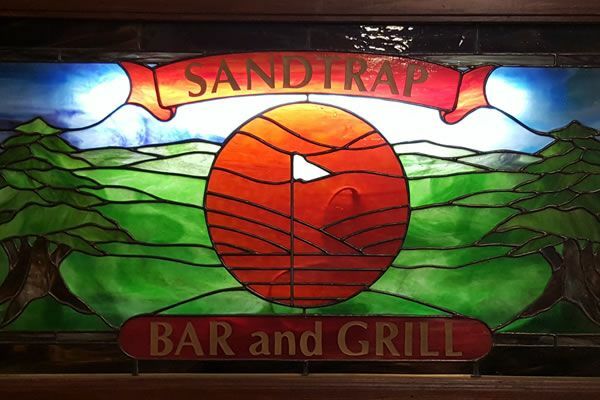 Whether you’re stopping in after a round of golf or you’re just coming in for a family meal, the Sandtrap Bar and Grille is open all year round for good food and good times. We invite you to enjoy a delicious meal within a warm community atmosphere punctuated by beautiful views and friendly waitstaff. In the summer, enjoy a refreshing drink and quick snack after a game of golf, or relax with a leisurely meal and cocktail at sunset. We don’t close our doors when the weather turns frosty, so come inside and enjoy one of our signature dishes and expanded wine list any time of the year. We welcome the general public alike for an enjoyable visit despite the temperature outside. From juicy burgers and steaks to baked kibbe and stuffed grape leaves, we offer a delectable selection of the finest foods in the Merrimack Valley. Our experienced chefs serve up tasty lunch and dinner specials all year round, paired with an extensive wine, beer and spirits list for a delicious dining experience kids and adults alike will love. Join us every Thursday night as we host live music to help you relax after a long day. Enjoy the sultry tones of the locally renowned George Williams Band from 6:00 p.m. to 8:00 p.m. every Thursday throughout the year. Come down on selected Fridays or Saturdays to check out some local performers. Got a special event coming up? From bridal brunches and showers to birthday parties and anniversary parties, the Sandtrap is happy to accommodate your group. We welcome you to celebrate your next event with us and enjoy the same great food and attentive service you’re used to. We are your neighborhood gathering spot. Get up-to-date News and Events first !